This movie was made in 1996, and is what i consider the debut of Wiccan beliefs and occult practices to main stream minds all over the world, from the real practitioners of magick in Hollywood. The first thing that I would like to point out is that this movie was released in 1996, throughout the whole movie they explain the power of 3, or the three folds law, as it is known by some people. Here is a quote taken directly from the movie, "By all the Power of Three times Three- as we Will, so shall it Be!" 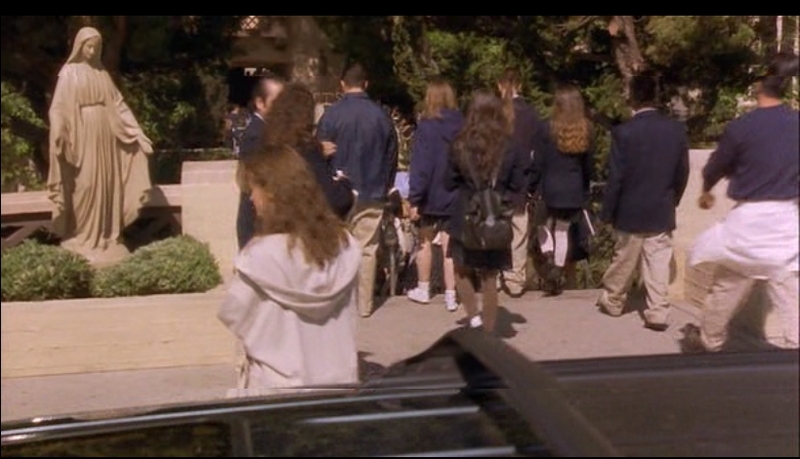 This I believe is exactly the meaning for the timing that this movie came out, 1996. (3 x 3 = 9, 3 x 2 = 6, 3 sixes = 666). In the opening of the movie you see 3 young girls doing a ritual, and they are chanting, "Now is the time, Now is the Hour, Now is the time, Now is our power..."
Throughout the movie they show a number of Catholic, or Christian symbolism, such as the Virgin Mary, and Jesus on the Cross. However, none of the so called witches ever look at it. No one in the circle ever acknowledges the Virgin Mary, or Jesus. Every time they are depicted in the film they seem to be turning there backs on them, or in some cases not noticing them at all. These girls attend a catholic school, and the evil witch Nancy, as she is called in the film, is the evil Gothic Catholic school girl that has a lot to rebel against. She lives in a trailer with her drunk parents, and her step father, that sexually abuses her. How did she come to attend a Catholic school anyways? Her family seems very poor, and I know from experience, because I have attended a Catholic school, that they can be very expensive. They don't stay poor throughout the whole movie however, because Nancy ends up killing her step father in a rage of Magick. This brings them some type of life insurance policy that gives them 175,000 dollars. She and her mother are so excited about the money, that they quickly forget about the no good step father's death, and that Nancy had killed him in her fit of rage. Throughout the movie the girls visit a very occult like book store, the All Seeing Eye symbol which is on the back of all of our one dollar bills in the USA, is everywhere. It can be found on the outside as well as inside of the bookstore. Later in the movie, they say that the store was built on a very old spiritual worship site. 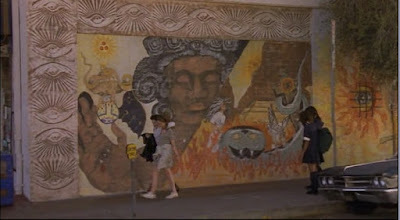 There is more to this painting on this wall however, the black Egyptian, that is worshiping the Pyramid without a capstone, has a head dress, that has an all seeing eye in the middle. There is also a window with the all seeing eye depicted as a sun, or the Eye of Horus, and it has bars over it. Could the sun in the background with 3 circles be another symbol for the 3 folds law, or maybe the holy trinity? Whatever it is none of the girls seem to notice. Please let me know in the comments what you think. When the main character enters the book store for the first time, she notices this room in the back of the store. She is somehow drawn to it, and before she is able to open the curtain, the owner stops her, and tells her, "This room is not for you." This is very strange, and they don't show you whats behind this curtain until the near end of the film. 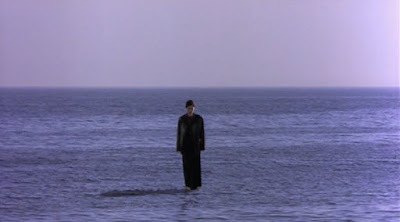 This movie also represents the constant battle between the good and evil forces of our world, or the duality of nature. The ying and yang, positive and negative polarities, etc. 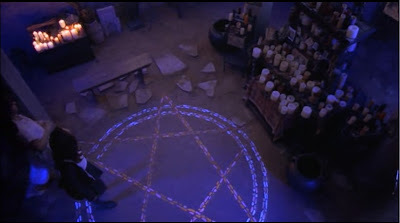 Here is a ritual depicted in the movie The Craft, where they do a blood ritual sharing each others blood, and drinking of "there sisters" in the circle. Before beginning the ceremony Nancy clearly states, "As above, so Below." Throughout our history ancient magicians, and Jewish mystic knowledge, revolves around this statement, and its origins are from the Emerald Tablet, or the Secret of Hermes. The wine that they used is named "Ariel" which has a number of meanings. It could mean blasphemy against the holy city of Jerusalem, or an angel in Judaism or occult lore. If you don't believe me look up Ariel on Wikipedia. There are too many listings to name here. 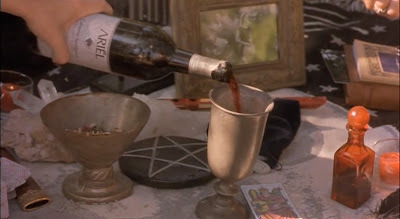 If you Google Ariel wine, you will find a non alcoholic red wine, that has the name Ariel. Why did they use this wine? And why is that reference not listed in Wikipedia? Surely it could be because they are underage, however throughout the movie, you see them drinking alcoholic beverages, so this kind of contradicts itself. I think in this screenshot everything has a meaning, as with the whole ritual performed in this scene. 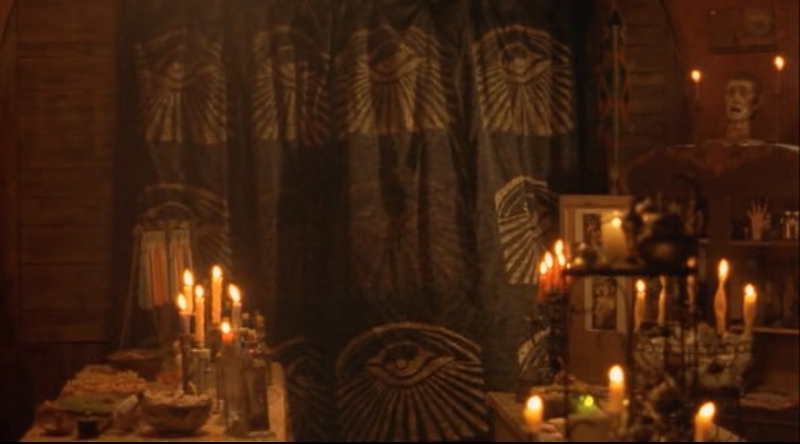 You also see a Tarot card on the table, that is "The Magician". This is the evil witch Nancy, that asks to take in all the powers of Menol, which is a made up deity, for the purpose of making a movie, in which the deity has no real meaning, except to go against Christian, or Catholic religion. 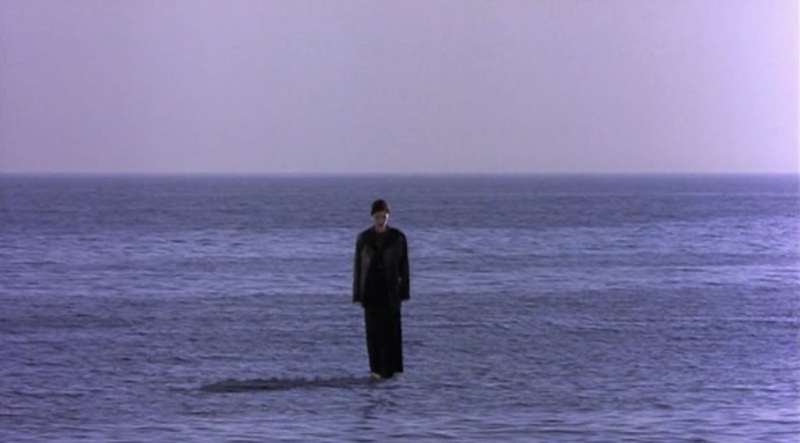 Notice how she is walking on water like Jesus? This was not put here by mistake I assure you. Everything in this movie has a meaning if you look hard enough. Can anybody say Anti-Christ? This is what is behind the all seeing eye curtain in the bookstore. I don't have to explain the evil that exists in this screenshot right? It is kind of in your face...Anyways, That is it for now, I hope you see what I have been trying to explain about Hollywood, and there subliminal signs, and numerology with movie releases and stuff. I hope you have enjoyed this article, and thanks for reading, and don't forget to comment. Hi, I just have one comment about this blog. You state early on regarding the production company: "also wanted to point out the production company...A Douglas Wick production....Did anyone ever hear of this production company making any other movie of any sort?" Might be worth getting on IMDB here but Douglas Wick has produced a number of films such as all the Stuart Little films; Hish; Girl,Interrupted; Gladiator; Hollow Man; Spy Game; Peter Pan; Win a Date with Todd Hamilton; Bewitched; Jar Head; Memoirs of Geisha and RV: Runaway Vacation. Obviously this is just one point in your argument but might be worth checking these things as a matter of course. 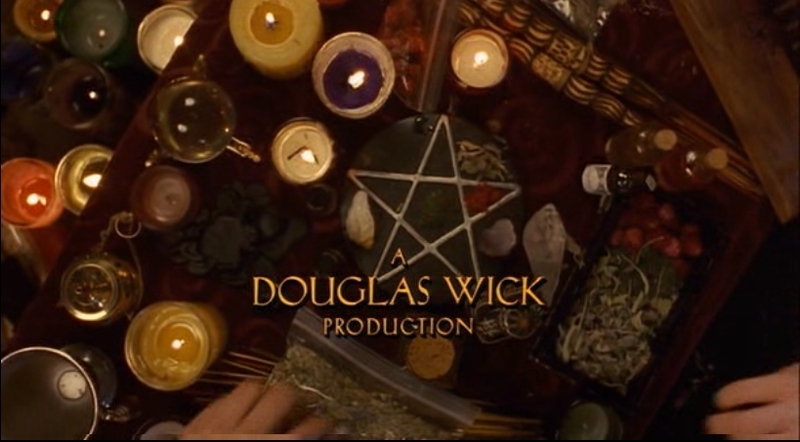 Think it can pretty much be stated that Douglas Wick has made a variety of movies, not just ones about Witchcraft. Or full of magic/Mason symbols. Thanks Eadie for your research. I did not know...I had just never heard of it, IMDb was a good call. Love and light. 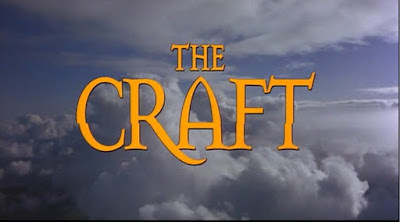 By the way Eadie....All the movies you mention do have masonic and esoteric symbolism, they just aren't as blatant about it as the movie "The Craft". Masonic symbolism is in almost every production company even if it is subtle. What interests me is that you are so quick to defend this Douglas Wick company. I hate to break it to you but their are more research tools other than IMDB its called Google you should check it out some time. Masons are all over the world. I saw that Hallmark on their 'mahogany' cards have a freemason symbol. My grandparents have most of their stuff Hewlett, books, etc with freemason symbols on them. These people r evil no matter how they try to portray themselves to others. Whatever Freemasonry stood for in the beginnings of its creation, the freemasons over the last 60yrs or so have perverted their little club n I read they even take in all these mexicans now. Um...most of them aren't even spos to b in our country. And to accept a group of peoples like the mexicans who are too weak to fight for their country back n then they come here like cockroaches n take take take from americans then y would u want them in their club which is spos to hold only the very elite n patriotic types in it? Don't think those mexicans r elite or patriotic since they can't even come to out country the legal way n learn to speak english. So I hate to say it, but freemasons now in modern times should b seen n treated like criminals n traitors to our country n it's laws. @tooreal you sir, are racist and very ignorant. What does mexicans coming to our country have to do with anything? Other than the fact that I'm hispanic? Thanks for your input....but seriously you need medication. Did you notice the writing on the wall behind Sarah when she is coming out of the bathroom after Nancy caused her to hallucinate all the bugs and snakes. She looking at the sink and realizing she was hallucinating and there is writing behind her on the wall. I can't make out what it says. Do you know? It says Gustav Klimt and i still wonder till now what relationship that could been with "The Craft" and "Gustav Klimt"
This film isn't about Wicca. It's about Witchcraft. Not the same thing. Wicca has no devil. It had a God AND a Goddess. No blood is exchanged during initiations, and generally covens are larger than four people. You also need to be over 18 to be considered for initiation. Holy cow, did you just use wikipedia for your research? 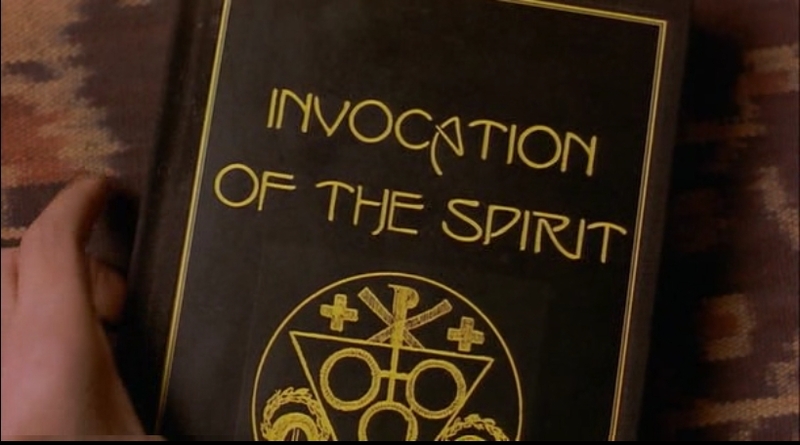 First, this was not the first time wicca was brought to the mainstream. Its been a movement since the 60's. 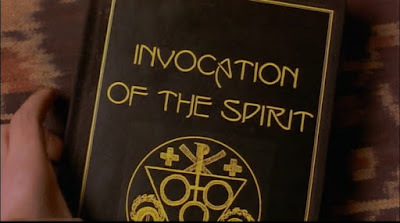 And while I love this movie and feel it portrays witchcraft and wicca in an overall positive light, it is still very much fictional. I'm just so tired of christians attacking other religions that they are too lazy to learn anything about.